If you are in the market for a hideous car made even more hideous by a custom paint job, today is your lucky day. 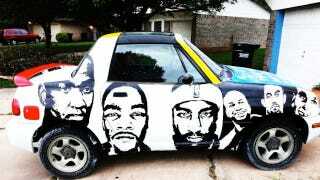 Drew Hooper, who can only be described as a Thunder super fan, decided to spruce up his 1996 Suzuki X-90 in really the only way a 1996 Suzuki X-90 can be spruced up: he painted Thunder players' faces on it. There's Kendrick Perkins, Kevin Durant, James Harden, Russell Westbrook and even an inspiring Frederick Douglass quote on the hood. This car literally has everything. Including 125,000 miles and an inoperable driver's side window. Jenni Carlson, of Mike Gundy "I'm a man" fame, did an interview with him for The Daily Oklahoman, which you should really check out. Hooper, who is an artist and painted the car himself, explains the transformation process required. It involves, among other things, having lunch with your cousin on Thursday and getting paint. The Oklahoman story is from way back in May, but the Craigslist ad was just published early this morning, so I guess he's having a tough time selling it for some reason. In all seriousness, the artwork is pretty good, it's just on a Suzuki X-90.